Some exciting news here at Ripe Vapes. Our team recently made the trip out to the UK to attend Vape Jam 2, and we are proud to announce that our VCT Private Reserve won the “Best Tobacco E-Juice Award”. 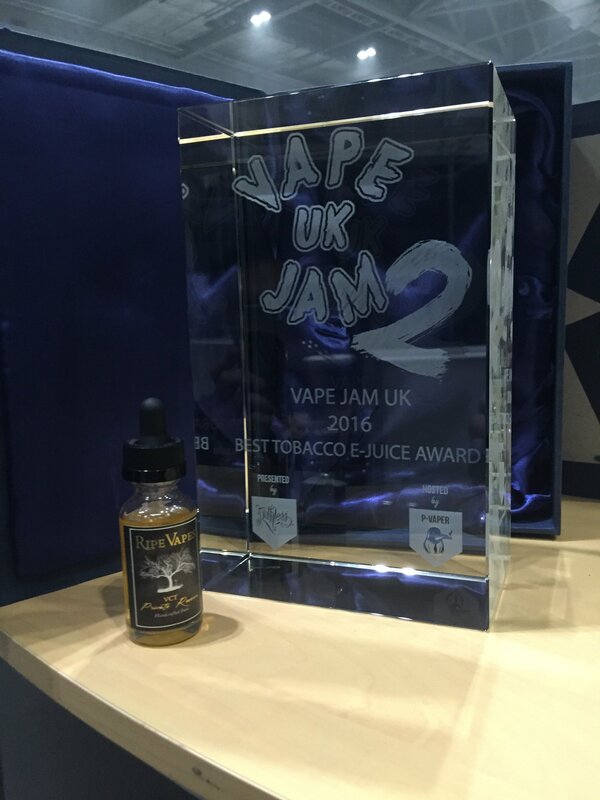 For the fans that have been following us for a while, you might remember that VCT also won “Best Tobacco Flavor” at Vape Summit 2 in 2014. We think our recent win reaffirms our belief that Ripe Vapes e-liquid is right at home with the leading brands in the USA, UK, and internationally. Ripe Vapes has always performed well in head-to-head tasting competitions at national and international events, and we hope it continues to do so. A large part of our success is the time that goes into making our joose. Ripe Vapes VCT Private Reserve is only available in limited quantities because each batch is aged for 90 days in oak casks. Availability varies widely throughout the year, so check with your local shop for purchases. If you can’t find it there, try ordering direct from www.RipeVapes.com and use Coupon Code FSD2016 in the Cart for Free shipping. Vape on! this is amazing stuff. cant really tell the difference between vct and vct private reserve but am looking forward to trying keylime and monkey snack. Oh great do you also have one for 2017?